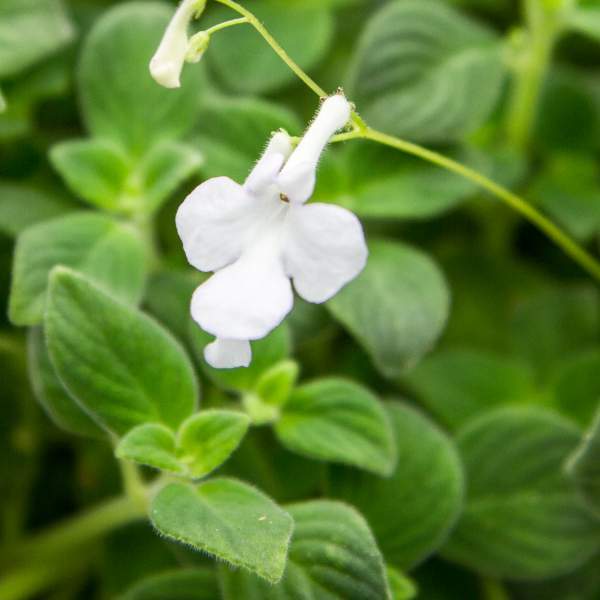 Streptocarpella are native to South Africa and are a part of the Gesneriad family, like Lipstic (Aeschynanthus) and Goldfish (Columnea) plants, but we think of Streptocarpella as easier to grow because of their everblooming habit. They grow best in hanging baskets or four-inch pots with partial shade. Some early morning or late evening sun is fine, but bright, full sun will burn the foliage. Be careful of watering with cold water, as the leaves will develop leaf spots from standing water. Grow them under drippers, applying water to their base to avoid cold-water damage on the foliage. Streptocarpella are normally grown as a houseplant, but they are hardy for zones 9-11. For best results with Streptocarpella White Trailing, use a constant feed program of 200 ppm N. A pH between 5.5 and 6.5 is important for the healthiest plant color. Avoid any cold water standing on the leaves as they will be damaged and produce leaf spots like an african violet. These plants are ever-bloomers that will look great all year long when kept indoors. Streptocarpella White Trailing do not require pinching, but you can trim larger baskets to maintain their shape if you want. Allow 4-6 weeks after the last pinch for blooms to appear. Space pots as needed for pot size. Normally 2' centered spacing is adequate. Plant growth regulators are not necessary for Streptocarpella . Allow the plant to grow, and shape the pots through proper pinching. Mealybugs and thrips are Streptocarpella's biggest pests. Streptocarpella White Trailing is not prone to many diseases, but don't oversaturate the soil. If the plant sits in moist soil for an extended amount of time, you could end up with root rot or botrytis. Botrytis grey rot is usually associated with wet or humid conditions. You can prevent botrytis by allowing the plant to dry out between waterings, allowing for good airflow in your greenhouse, and spacing to allow the sun to penetrate to the soil level. The most common chemicals used to treat botrytis and root rot are Medallion and Banrot. Use them as a drench according to each label's instructions. Pinching is not required on a natural season bloom schedule, but it is useful in shaping the basket as needed. Remember to give yourself a minimum of 4 weeks from the last pinch for blooms to develop.